50% - 80% OFF - While Supplies Last!! 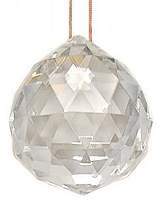 Value priced quality Crystal Prism Balls are pre-strung and ready to hang by any window in your home. They mimic the popular Swarovski 8558 facet cut. Feng Shui masters recommend hanging crystal prisms in the bedroom and the home as a potent Feng Shui love cure. 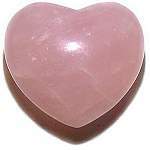 Crystal prisms radiate and increase the precious Yang Chi Energy which is important for love and harmony! Hand carved A grade Natural Blue Agate Eggs from India have a beautiful array of sea glass pearl, blue and opal hues in a variety of banded patterns. Agate stimulates analytical abilities and mental precision. It has been reported to strengthen the sight, diminish thirst and promote marital fidelity. The Walnut Finish Oriental Stand is included. Rare Shungite Eggs from Lake Onega, Russia have a satin leather like finish. Russians have used Shungite and Shungite waters for their powerful healing and purification properties since Peter 1st. Shungite contains a unique conductive inorganic carbon with C60 Fullerene molecules in tight Bucky ball shapes, thought to be created by lightning charges that are five times hotter than the sun. Fullerenes display mysterious quantum bi-location and molecular nano programming properties. 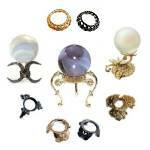 Choose from 14 Birthstone Colors!! Hard to find 45mm Fiber Optic, Cat's Eye Hearts. 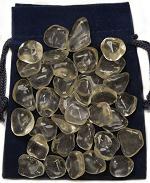 These stunning Cat's Eye crystal 1" thick puffy hearts are available in 13 vibrant colors and can be used as Feng Shui tools to clear negative energy and increase the positive Chi energy in dark rooms and corners. Each comes with it's own velvet pouch. See Cat's Eye Hearts in all 13 jewel colors. Natural Red Selenite carved hearts from Morocco have a translucent pearl sheen and are a form of Alabaster. Selenite is a powerful cleanser of negative energies, used by crystal healers to clear quartz crystals. Selenite is a natural cat's eye stone as opposed to the man-made fiber optic varieties. 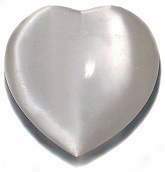 Hand carved and polished by Moroccan artisans 2" or larger gemstone hearts. Selenite grows in long "cat's eye" translucent pearl white crystals and is a form of Alabaster which was used in Ancient Egypt. It is said to be a powerful cleanser of negative energies, even clearing quartz crystals. Selenite resembles the light of the full moon and is a natural cat's eye stone as opposed to the man-made fiber optic varieties. Beautifully polished 60mm or larger puff gemstone hearts with velvet pouch. A winding rose stem with an exquisite faceted rosebud. Handmade crystal from the Kensington Collection. 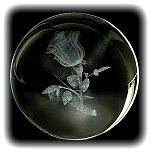 The Rose is a symbol of everlasting love which is captured in this hand made crystal creation. Limited production, hand painted Water Moon Kwan Yin Goddess in her Yang Bodhisattva form. The Water Moon Kwan Yin is sheltered by a large lotus leaf and seated on a rock with a foot resting on a lotus flower in the water, radiating calm and compassion to the supplicants of the world. 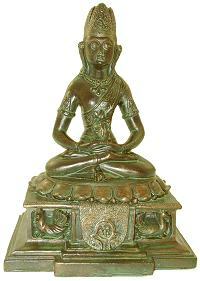 The Sanskrit Avalokiteshvara Bodhisattva has vowed to free all living beings from the suffering of earthly life. 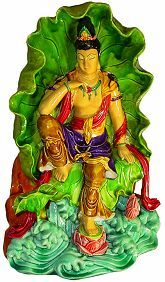 Colorful, hand painted, high glaze finish stone resin Water Moon Kwan Yin statue gives the appearance of a delicate ceramic figurine. 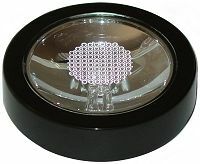 This 3 3/8" round, portable 3 color LED light stand has a shiny Black Base and flat top with a 1" wide open center where 3 extra bright LED lights in red, blue and green twinkle on and off randomly and produce a color changing light show. There is an on-off switch on the side. Use 3 AA batteries for days of continuous use. Batteries are not included, click for AA batteries. 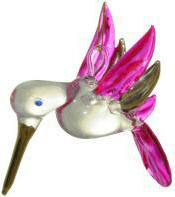 Charming Murano style long tailed Sylph Hummingbird large glass figurine has bright colored scalloped designs on the body and wings. Each glass bird is unique and hand crafted. 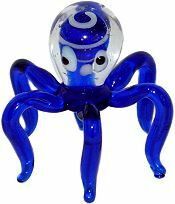 Use as an eye catching paperweight or give a gift that can be cherished for a lifetime. 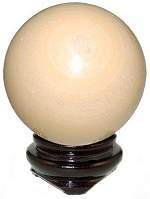 Hard to find 60mm Fiber Optic Cat's Eye Sapphire sphere. 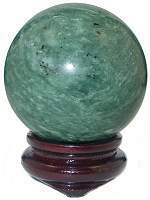 These stunning Cat's Eye crystal balls are available in 17 vibrant colors and can be used as Feng Shui tools to clear negative energy and increase the positive Chi energy in dark rooms and corners. 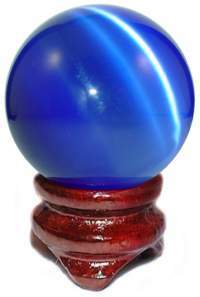 Special closeout deal on 60mm Sapphire sphere with it's own oriental wood stand. Superb quality Brazil Clear Amethyst in Quartz Pyramids have light violet coloring in lovely striated clear Quartz formations that intrigue the eye. Amethyst promotes loyalty and devotion as well as being known historically to foster sobriety. These are the last of high quality stock, hand carved and polished Brazil Amethyst 1 3/4" pyramids at this low price. Dyed clear Crackle Quartz tumbled stones in large sizes of 1 1/4" to 1 3/4" stones. Quartz historically magnifies Chi, the personal life force at the core of being and enhances its flow, nourishing the mind, emotions and physical body. 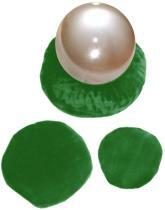 Exquisite beveled clear crystal display stands are perfect for small spheres and eggs. 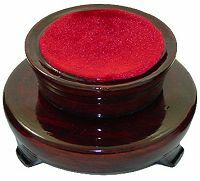 These specially priced small Crystal Stands are 30mm or 1.2" square with beveled corners and sides. Now available for $0.75 each while supplies last. Don't wait for a rainy day to see a rainbow, when you can have one of your own to cheer you up whenever you want. Lovely handmade German Peacock Crystal paperweight. 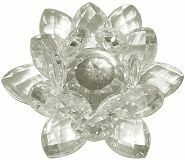 High quality, flawless, full lead crystal facet cut egg with facet cut stand in hand made imported crystal. Feng Shui masters recommend placing crystal prisms in the bedroom and the home as a potent Feng Shui love cure. Crystal prisms radiate and increase the precious Yang Chi Energy (light) which is so important for life and love! Beautiful Chinese rattan wall scroll in authentic oriental style brushwork with well known symbols and themes incorporating both vibrant and soft colors that are pleasing to the eye. The scroll is light weight and easy to hang with the attached yellow silk tied ribbon. Large exquisitely hand painted Eliza Doolittle - My Fair Lady style Victorian flower girl figurine. Smiling bright eyed girl with feathered hat and a basket full of red roses and more on the side. 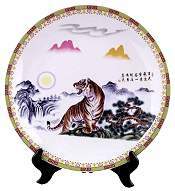 Update your decor with this high quality, oriental large porcelain display plate from Jingdezhen, the porcelain capital of China, producing ceramics for over 1000 years. 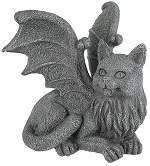 The superior quality and elegant design make it an exquisite addition to your collection and decor. Porcelain 16" plate includes dark wood colored display easel. Frame-able Art Card from original painting by Marie Buchfink. Blank card, suitable for any occasion. Beautiful Brazilian Clear Amethyst spheres. 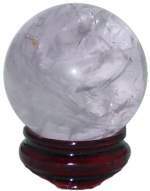 These spheres have a clear pale Amethyst color with good clarity. This is a contrast to the often opaque dark Amethyst sphere. Amethyst promotes loyalty and devotion as well as being known historically to foster sobriety. Excellent polish and finish with no cracks. The Walnut finish Oriental Stand is included. These round, velvet pillows are a perfect display for spheres, eggs, paperweights, crystals, jewelry or any asymmetrical object with dramatic style! In 4 gorgeous colors Royal Blue, Black, Wine Red or Emerald. Beautiful large coin charm in the auspicious red silk string ending in double tassels with intricate Longevity Knot above and below the charm for good health and long life! The Zodiac center has 12 Zodiac coins around a large Chinese coin with Feng Shui symbols of peace, harmony and abundance. 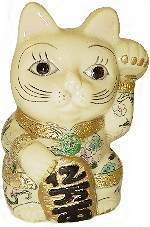 Ideal for bringing blessing, good fortune, prosperity and auspicious energies into the home or office. 18” long from tip to tassel. Frame-able lithographic Art Card in heavy paper stock of an original painting of Giraffes in the Wild from the naturalist Ilene Meyer Collection. Blank card, suitable for any occasion.